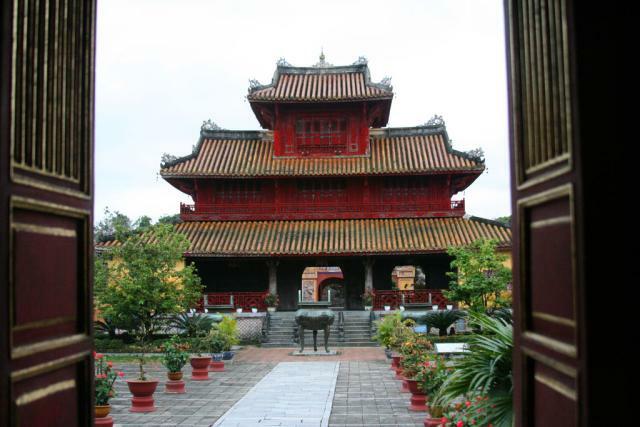 When Derek first visited Vietnam, he loved it for its lack of Western influence. Eleven years later, the Westernization of the country seems nearly complete, but we still really enjoyed our time there. We were lucky to be in Vietnam during Tet, the lunar new year, and so we saw everything at its most festive. (ItÂ´d be like being in the U.S. in mid- to late- December.) Hanoi and Ho Chi Minh City, the two biggest cities, both vibrated with excitement and energy. Like China, communist Vietnam has recently welcomed capitalism with open arms. The economy is growing at eight percent a year, and signs of the countryÂ´s newfound wealth are everywhere. Motorcycles fill the streets and fancy restaurants seem to be springing up on every street corner. Travel here was very easy, especially the way that we did it. (Other than a quick foray into the middle of the country, we stuck to the coast, where most of the tourist attractions (and, therefore, the tourist infrastructure) are.) Plane tickets are cheap and the buses and trains move quickly and are on time. While we saw the occasional sign for a dog-meat cafe (yes, some Vietnamese people really eat dog meat), many restaurants catered to Westerners, so the taste of home was never far away if we tired of noodles and spring rolls. While Vietnam and the U.S. have an obvious history of tense relations, things on that end seem to be improving. During our time there, we were generally greeted as friends. While itÂ´s not worth visiting Vietnam for its beaches alone (go to Thailand for that), they were nice, and the verdant, rice paddy-filled countryside was gorgeous. One big, unanticipated bonus was the French influence that still abounds throughout the country; itÂ´s evident not only in the delightful and readily available baguettes, but in VietnamÂ´s wide streets and its colonial architecture. 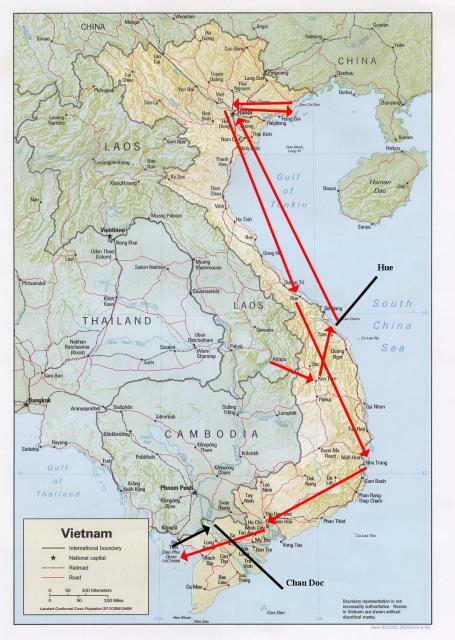 WeÂ´ve said this about nearly every Asian country that weÂ´ve visited, but weÂ´ll say it again: come to Vietnam now, before Western influence has taken over completely. Bac Huong Hotel (Jan. 21-23, 2008): At about $15 a night, this place was a great value. ItÂ´s in a good location, was super clean, well decorated and even had cable! Thien Thanh Hotel (Jan. 23-27, 2008): ItÂ´s a little bit of a walk (maybe 5 minutes) to most of the restaurants, but this place was still excellent. They have wireless internet in the lobby, and the deluxe rooms ($50) have balconies overlooking rice paddies and are wonderfully furnished. The standard rooms ($35), however, seem to be a better value. You lose the balcony, but the bathroom in our standard was actually nicer than the one in our deluxe. Had it not been raining, we couldÂ´ve taken advantage of the small, but nice, pool. Heart Hotel (Jan. 27-31, 2008): Great location, great value. Our room ($30) was huge, clean and had broadband internet. They serve a decent free breakfast, too. Viet Anh Hotel (Feb. 1-2, 2008): We stayed here ($35) because the Heart Hotel was fully booked, but we ended up really liking it. We had a HUGE room with its own computer. The place smelled a little funny but was nice otherwise, and it was very centrally located. Hai Au Queen Boat (Jan. 31 â€“ Feb. 1, 2008): The rooms were small (of course–we were on a boat! ), but clean and fairly comfortable. Unlike the rooms, the common areas on the boat werenÂ´t heated, and it was freezing! The whole boat trip cost us a little over $50 a person, which included meals, lodging and the use of a couple of kayaks. Hue Heritage Hotel (Feb. 2-4, 2008): YouÂ´ll know this place (about $50 a night) by its mock classical facade… It has a great breakfast, but we had a tough time getting the heat and hot water to work. ThereÂ´s a pool on the roof, so this may be better in the summer than it was in the winter. Sunrise Nha Trang (Feb. 4-7, 2008): At $150, this place was one of our biggest splurges of the trip. The price aside, it was really nice. ItÂ´s in a great location and has a gorgeous lobby, wonderful rooms with balconies overlooking the South China Sea and a breakfast buffet that was definitely one of the best weÂ´ve ever had. It definitely felt four-star to us. An An Hotel (Feb. 7-11, 2008): At $35, this hotel was one of the best values weÂ´ve discovered so far. The rooms were clean and had wireless internet, and it was located right in the middle of a neighborhood geared toward backpackers (read: cheap food and lots of places to get your laundry done). Nhat Lan Bungalows (Feb. 11-13, 2008): These bungalows are at the end of a long strip of hotels, which is great because theyÂ´re just a short walk from a long stretch of empty beachfront. At $25 a night, they were the cheapest option we could find, and the rooms themselves were quite nice (and came with a hammock for each of us)! Vinh Phuoc Hotel (Feb. 13-14, 2008): At $6 a night, this place was everything it needed to be. The rooms had hot water and A/C (unusual for this price), and the hotel was clean and centrally located. Dakbla’s: The Lonely Planet recommends this place, but we’re not sure why. The spring rolls and other snacks we ordered were expensive for Kon Tum and not all that good. Quan An Restaurant: The no-frills Quan An served up some pretty good fried shrimp and lemongrass chicken at incredibly low prices. Quan Chay: This place dishes up tasty pho at lightning speed, and it’s open later than most in a town that shuts down early. Cafe de Amis: A must-do in Hoi An, Cafe des Amis is right on the river. Its incredibly friendly owner serves up a different set menu (“whatever he feels like cooking”) every night, and there’s a vegetarian option for non-carnivores. Mango Rooms: Another fantastic Hoi An option, this place felt more like it belonged in NYC than in Vietnam. It’s not cheap, but its incredibly flavorful fusion dishes make it worth the splurge. Before and Now: This cool sports bar/restaurant has wifi, as well as good pizzas, good cheeseburgers and a great atmosphere. Quan An 96 Restaurant: The food at this riverside place took a long time to arrive, but the white rose and cao lau (pork dumplings and a noodle dish with croutons, respectively, that are unique to Hoi An) were worth the wait. Cafe Can: In a beautiful setting right on the riverbank, about $6 here buys you a set lunch that includes course after course of great, Vietnamese food. Good Morning Vietnam: Derek claims that the pasta we ate here was the best we’ve had on our trip so far. The quality of the food’s not a secret; this place was packed! My Hanh Restaurant: There’s nothing like eating grilled seafood on a balcony that overlooks miles of gorgeous seashore, which is exactly what we did here. They served slices of pineapple dipped in chili pepper and salt for dessert; it doesn’t sound great, but it was! Paris Deli: This place felt like a little piece of Paris in Vietnam. Great red wine and a cheese plate–what else could we ask for? Just in case we needed more, they also served up some lovely sea bass. Club Opera: This refined, upscale place was pricey but served up great French-Vietnamese food. La Salsa: The food at this little eatery wasn’t good enough to justify the (fairly steep) price, but it was nice to find tapas in Hanoi! Al Fresco’s Cafe Grill: Continuing with our pattern of taking a break from Vietnamese food, we went to this Tex-Mex place for some decent nachos. Lots of other westerners seemed to have the same idea; the tables were full! Customized Tour Restaurant: We were pleasantly surprised by this place, which we visited on a whim, until we realized that rats (mice? let’s hope…) were crawling all over the ceiling beams above our table. Ladybird Cafe: Alyssa raved about the rice noodle dish that she ordered in this nondescript place, and Derek’s and Shanna’s food was fairly good, too. Restaurant Bobby Chinn: Run by the trendy, charismatic (he came to our table–and everyone else’s–to chat), celebrity-ish chef, Bobby Chinn, this gourmet place is pricey, but oh-so-good. The decor is super stylish, and Shanna’s still dreaming about her glazed salmon and mashed potatoes. Tourist restaurant in Halong City: This was yet another piece of evidence to support our theory that all restaurants visited as part of a tour group are flavorless and mediocre. Central Market: We tried some cool new things here (a rice dish with fish and egg, some fruit we’d never seen before) and, best of all, no one got sick! Y Thao Garden: The Lonely Planet raved about this restaurant, but we weren’t sure that it deserved all of the praise. Some of the dishes were presented in a cool way (shrimp skewers on a pineapple carved to look like a peacock), but the food just wasn’t that great. Dong Que Restaurant: We visited this restaurant as part of a tour group. Enough said. DMZ Cafe: This fun place was packed with foreigners eating pizza, guzzling draft beer, playing pool and grooving to American pop music. Pho 24 (in Danang): We know that chain restaurants tend to get a bad rap, but this place was really good. We loved the pho and the fruit shakes, the friendly staff and the super clean surroundings. We paid a little more for this than we would’ve for pho on the street, but it was definitely worth it. Airport Restaurant (in Danang): The best thing that we can say about the noodle soup we ordered at this airport-based place was that it filled us up and it didn’t make us sick. Hanabusa: This place was as pricey as an American sushi bar (something we’re not used to in uber-affordable Asia), but the sushi was just as good as most of the stuff we get at home. Louisiane Brewhouse: With tables surrounding a well-lit swimming pool just steps from the seashore, you can’t get a much better setting than this. The food was quite good. We came for a late dinner, but this place would be perfect for an early evening happy hour. Sailing Club: This place served up the best Indian food we’ve had outside of India. The chicken korma was spectacular. Go2 Cafe: Go2 is a three-level restaurant/bar/club. At lunchtime, the restaurant was packed with foreigners, some of whom seemed to basically live in the place. And we can see why: the green curry and lemongrass chicken were incredible! Mogambo: We’d heard that the burgers and wings here were just as good as the ones available at home, but we were scared to believe the hype until we tried them for ourselves. Our verdict: they come pretty darn close. Lemongrass: This place came so highly recommended that we were surprised to find that the Vietnamese food here was just fair to middlin’. Bunta: The motto here is “everything is bun” (“bun” meaning “noodles”), and they’re not lying. Although the menu may be limited, the noodle dishes and iced coffee here are great, the setting is modern, and the location is perfect for a midday break from seeing the sights. Le Pub Restaurant: This place felt more like an English pub than like something in the middle of HCMC. The bar food (chicken fingers and nachos) made for a great snack. Camargue: This romantic, upscale French restaurant would make for a great date. We all loved our food, and the wine list was extensive. The elegant surroundings (itÂ´s in an gorgeous, open-air villa) contrasted a little strangely with the music of the rock band playing at the restaurantÂ´s trendy bar below. Golden Elephant: Derek visited this place while Alyssa and Shanna searched the city (in vain) for a yoga class. He thought the Thai food was just average. Sushi Express: This NYC-style place offers sushi that guests select from a conveyor belt that revolves through the restaurant. We opted for the $20 all-you-can-eat option, and we definitely got our money’s worth! Quan An Ngon: We probably wouldÂ´ve liked this place (which offers up Vietnamese street food in a nice setting) more if most of the items on the menu hadnÂ´t been unavailable. We got there late (which, in Vietnam, means after about 9:00), so this popular place had run out of most of its food. We liked the open-air setting, but Derek says he wouldÂ´ve preferred just eating on the street. Du Liche Con Quy: We came here as part of a tour group, but it wasn’t actually all that bad. $6 bought us a whole, fried fish propped up between chopsticks–pretty cool (though we felt sorry for the little guy). Nhat Lan: If you were lucky and this restaurant at our hotel actually had what you ordered (which was rare), you got a pretty good meal in an amazing setting (just steps from the seashore). The staff, however, probably won’t win a congeniality award any time soon. It’d be better if they didn’t cut their toenails and perform other grooming tasks while on the premises. Eden Restaurant: This seaside place offered decent food and the chance to play Connect Four, but the greatest thing about it was the coconut ice cream–the best any of us had ever had. Hong Phat: We had some inexpensive fried rice here that may or may not have contributed to the food poisoning that Derek got a few hours later. We would like to thank the following individuals who gave us a wedding gift that we used in this country: Maryann & Myron Wells, Scott Wells and Amy Hall, and Todd and Julie Maples. We really appreciate it!